Twenty-two samples of ingredients of recreational drugs before being sold on the drug market obtained from a dubious drug dealer were analyzed by gas chromatography/mass spectrometry, high-resolution mass spectrometry, and nuclear magnetic resonance (NMR) spectroscopy. The present study showed 15 novel designer drugs, which have not been described in scientific literature. They included three NBOMe drugs 25H-NBOMe, 25D-NBOMe, and 25E-NBOMe, three other phenethylamine-type drugs 25I-NBMD, RH34, and escaline, eight cathinone derivatives 5-DBFPV, 3,4-MDPHP, 3,4-dimethyl-NEB, 3,4-dimethyl-α-ethylaminopentiophenone, 3,4-dimethyl-α-PVP, 4F-α-ethylaminopentiophenone, bk-IVP, and bk-IBP, and a phencyclidine derivative MMXE. In addition to the above novel compounds, known compounds such as 25I-NBOMe, ADB-CHIMINACA, 5F-ADB, and butane-1,4-diol were also identified from some samples. 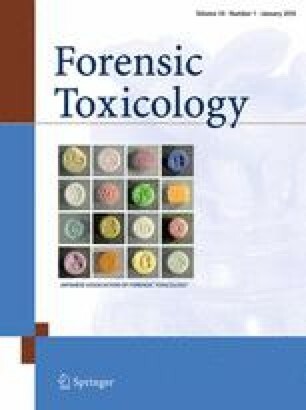 The electron ionization mass spectra, high-resolution data of molecular formulae, and NMR spectra presented in this article seem very useful for forensic toxicologists, who are obliged to identify new psychotropic drugs in any dubious products and/or human specimens. This work was supported by JSPS KAKENHI Grant Number 15K18908. The authors are grateful to Mr. Atsushi Hosoya (a research collaborator) for his assistance obtaining drug samples.